« Building a new kernel for the raspberry pi, including support for i2c, spi and working version of the driver rtl8192cu. Raspberry pi and i2c. Connecting a 24Cxx eeprom. If you followed my previous blog entry, you have a nice raspberry pi system with support for i2c. Now it is time to test if the i2c bus and the driver is working. Let’s try to connect a i2c eeprom to the raspberry, since it is the only i2c device that I have in my drawer. Easy, just connect the 3,3v, the gnd, the SCL and the SDA pins. The program should work out of the box, and the content of the eeprom must be save into data. If you are using a 24C16 the file should be 2048 bytes length. The program provided by lmsensor seems to be bugged, basically when it write to the eeprom, we must way until the content has been written before continuing. Is it a bug in the driver, or in the application level ? Anyway, I find a solution, I simply reposition the eeprom read-pointer until it succeded. If you have a more elegant solution, I will be glad to hear about it. - 	You have chosen to WRITE to this eeprom. a time-consuming and very costly process! In your case your are probably just missing the i2c header. But anyway you must have a kernel which have support for i2c, either my version of the kernel or the one bundle in the Chris image. when I use 24c32 , i2cdetect only found in 0×50, not like your from 0×50 to 0×57 , and with -16 the program always fault, what side 24cxx you use? and pin 1,2,3 a0,a1,a2 should be ground right? Sorry for this late response, I missed these comments. I left all wire un-connected. A0, A1, A2 allows to change the default i2c address ( to have multiple device in the bus ). The default of the tools is for a 24C16. You can probably tweak it for bigger eeprom by changing the number of page, and the page size. Where can I found eeprom.c? Done ! indeed it is burned . Got back here ! 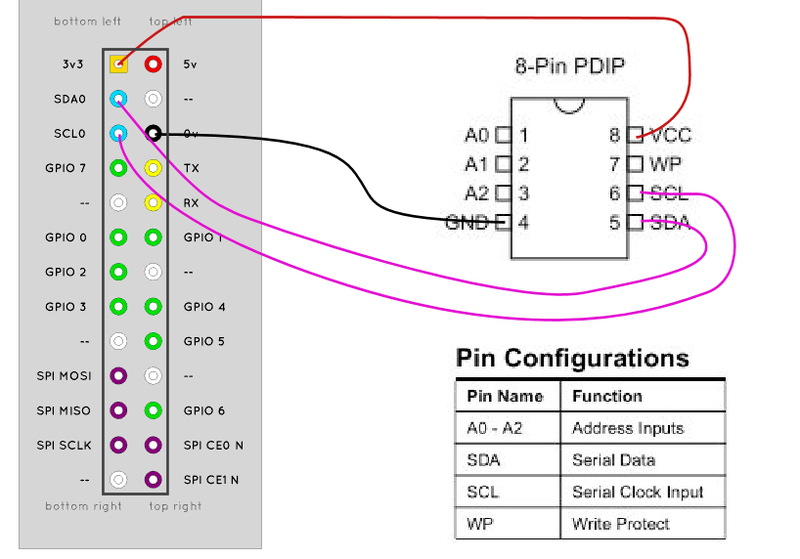 How do you write a 24c16 without WP pin 7 being pooled to gnd ? Something wierd I have just noticed is that I only seem to be able to write to the eeprom when logged into the pi itself, but reading will work from an ssh session too. I guess this is something subtle about how linux works. This entry is filed under 8192cu, i2c, raspberrypi. You can follow any responses to this entry through RSS 2.0. You can leave a response, or trackback from your own site.